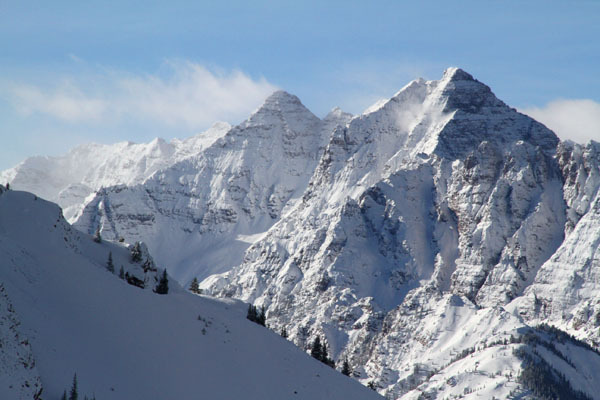 Aspen Skiing is comprised of four separate ski resorts all on one ticket, Aspen (Ajax), Snowmass Aspen Highlands, and Buttermilk, and one beautiful ski town in the heart of Aspen plus a separate slopeside Village at Snowmass. Aspen’s 4 resorts are part of the IKON Pass with three dozen major ski resorts, many of which Aspen’s Alterra now owns. Buttermilk is the smallest of Aspen’s four ski areas, best known for its terrain parks, night skiing and for hosting the big Winter X Games in January for almost two decades. Buttermilk also has the best view of Aspen’s famed Maroon Bells from the 9,900′ summit and the mountaintop Cliffhouse Lodge. Buttermilk can be a bonus on a powder day when all the other skiers crush the fresh tracks at Ajax, Highlands and Snowmass, and the majority of Buttermilk skiers are on the lower mountain, in the terrain parks, or lessons. With three express lifts, you can bag a lot of vertical at Buttermilk, and there are some fun runs at Tiehack and Ptarmigan. You can ski all 4 of Aspen’s mountains on the same pass and there is a free bus service that runs between each of these mountains, so you could even just hit Buttermilk for some buttery turns in the afternoon after Highlands. Hosting the Aspen XGames, in mid-January much of the front side terrain on the lower mountain at Buttermilk is built up with big terrain features for the XGames, huge jumps, a super pipe, a snowmobile venue and slope style course which are closed to the public just prior to and following Winter X at Aspen which is televised by ESPN Jan 28-31. Buttermilk’s Breakfast Club – The Cliffhouse restaurant, at the top of Buttermilk Mountain with beautiful views, serves a Friday Morning Uphill Breakfast Club. Uphill skiers skin up to enjoy breakfast in the restaurant for an affordable buffet breakfast, and bragging rights. Unlike the 1985 movie The Breakfast Club, there’s no detention, just downhill free form on your skis at the end.